First, identify the canning recipe you will use. Recipes can be found online or in recipe books. Often, canning recipes are passed down through generations as part of a family tradition; so don’t forget to ask around for time-tested canning recipes. Begin by cleaning jars and lids in hot soapy water. Keep jars and lids warm until ready to use. Do this by slightly submerging them in a pot of hot water, or keep them in a hot dishwasher and remove just before filling. Fill the water bath canner about one-third of the way with water and heat the water until hot, but not boiling. Prepare food according to recipe. Fill the jars with food, leaving about ½ inch at the top of the jar for expansion. Hand tighten the lids, just so they are snug. Do not over-tighten. Lower the jars into the water bath canner so they are sitting on the rack and not touching one another. Water should flow around the jars; add water as needed. The jars should be covered by at least two inches of water. Bring the water to a full boil and continue the full boil for the amount of time indicated by your recipe. Use a jar lifter to remove jars and set them out to cool. Listen closely, as the jars cool you will hear a pop noise as the seals engage. After jars have cooled completely, you can check the seal by pushing on the top of the jar, if the seal is tight it will not move. Any jars that did not seal can be put in the fridge and used within the next few days. Carefully label the jars and move them to a cool, dark, dry storage location. Enjoy your food! 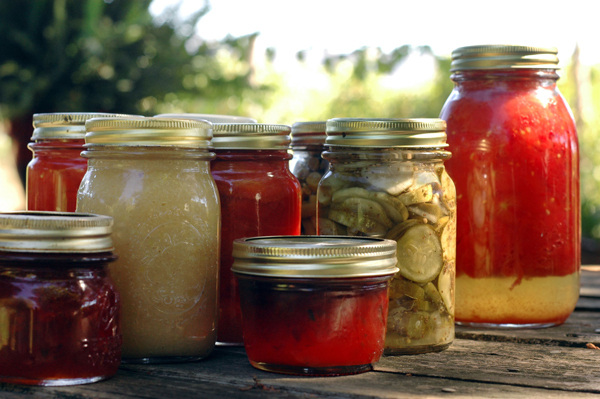 If you are interested in learning more about Canning, consider attending our Basic Canning class at the Stanwood store June 9th at 11am. Sign up to let us know you plan to attend by going to the Basic Canning sign-up page.